The proteins of all living cells are synthesized by ribosomes. The ribosome is a large macromolecule consisting of ribonucleic acids (ribosomal RNAs) and proteins; it has a complex asymmetric quaternary structure. In order to synthesize protein, the ribosome must be supplied with (1) a program determining the sequence of amino acid residues in the polypeptide chain of a protein, (2) the amino acid substrate from which the protein is to be made, and (3) chemical energy. The ribosome itself plays a catalytic role and is responsible for forming peptide bonds, i.e. for the polymerization of amino acid residues into the polypeptide chain. The program that sets the sequence of amino acid residues in a polypeptide chain comes from deoxyribonucleic acid (DNA), i.e. from the cell genome. Sections of the double-stranded DNA, which are called genes, serve as templates for synthesizing single-stranded RNA molecules. The synthesized RNA species are complementary replicas of just one of the DNA chains and therefore are faithful copies of the nucleotide sequence of the other DNA chain. 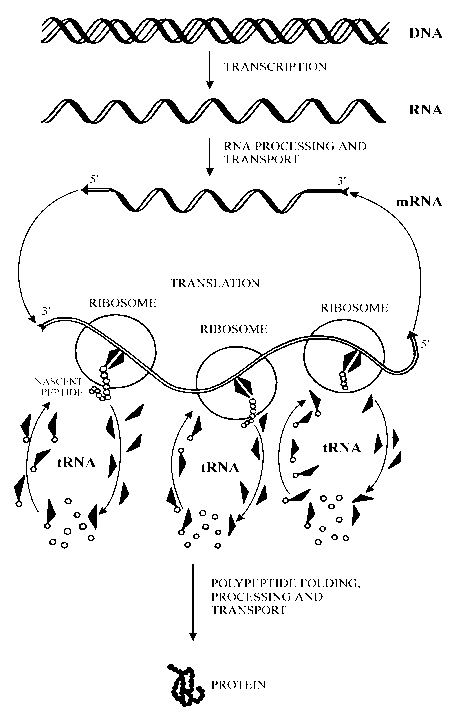 This process of gene copying, accomplished by the enzyme RNA polymerase, is called transcription. In eukaryotic cells, and to a lesser extent in prokaryotic cells, nascent RNA may undergo a number of additional changes called processing; as a result, certain parts of the nucleotide sequence may be excised from RNA, and in some cases altered (edited). The mature RNA becomes associated with the ribosomes and serves as a program, or template, which determines the amino acid sequence in the synthesized protein. This template RNA is usually called messenger RNA (mRNA). In other words, the flow of information from DNA to ribosomes is mediated by gene transcription and RNA processing, resulting in the formation of mRNA. In the eukaryotic cell the production of mRNA, that is transcription and most events of processing, is compartmentalized in the nucleus. At the same time all functioning ribosomes are localized in the cytoplasm. Hence, the transport of mRNA from the nucleus to the cytoplasm is a necessary step in the flow of information from DNA to ribosomes. In Prokaryotes, as well as in eukaryotic cytoplasmic organelles (mitochondria and chloroplasts), DNA and ribosomes are present in the same compartment, so that the ribosomes can reach mRNA and start to synthesize proteins during transcription; this is the so-called coupled transcription-translation. Proteins consist of amino acids. Free amino acids, however, are not used in the synthetic machinery of the ribosome. To become a substrate for protein synthesis, an amino acid must be activated by coupling with the adenylic moiety of ATP and then accepted by (covalently linked to) a special RNA molecule called transfer RNA (tRNA); this process is performed by the enzyme aminoacyl-tRNA synthetase. The resulting aminoacyl-tRNA is used by the ribosome as a substrate for protein synthesis, and the energy of the chemical bond between the amino acid residue and tRNA is used for forming a peptide bond. Thus, the activation of amino acids and formation of aminoacyl-tRNAs provide both material and energy to protein synthesis. Using mRNA as a program and aminoacyl-tRNAs as energy-rich substrates, the ribosome translates genetic information from the nucleotide language of mRNA into the amino acid language of polypeptide chains. In molecular terms this implies that while moving along the mRNA, the ribosome consecutively selects appropriate aminoacyl-tRNA species from the medium. The specificity of the aminoacyl residue of a corresponding aminoacyl-tRNA selected by the ribosome is defined by the combination of nucleotides in a corresponding stretch of mRNA associated with the ribosome. This brings us to the problem of genetic coding, i.e. the question of nucleotide combinations that determine, or code, each of the 20 natural amino acids. These combinations are known to be nucleotide triplets, which are called codons. Hence, the movement of the ribosome along the mRNA chain (or, in other words, the passing of mRNA through the ribosome) establishes a temporal order of entering the various aminoacyl-tRNA species into the ribosome. This order depends on the sequence of coding nucleotide combinations (codons) along the mRNA. The aminoacyl residue of each selected aminoacyl-tRNA is being attached covalently to a growing polypeptide chain by the ribosomal machinery. Deacylated tRNA is released by the ribosome into solution. In each act of aminoacyl-tRNA selection and deacylated tRNA release an additional energy, in the form of GTP hydrolysis, is consumed by the ribosome. All this results in the step-by-step formation of the polypeptide chain, according to the program of mRNA. A short historical review article, citing 311 references from 1897 to 1980, was presented by P. Siekevitz & P. C. Zamecnik in 1981 ("Ribosomes and protein synthesis", J. Cell Biol. 91: 53s-65s). 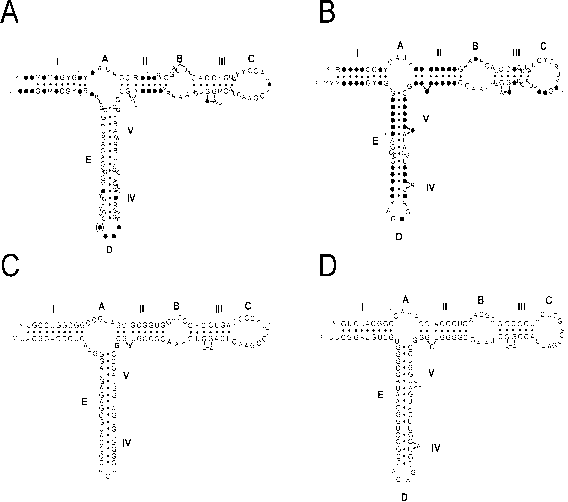 The general model of protein biosynthesis outlined above is schematically presented in Fig. 1.1. Figure 1.1. General schematic model of protein biosynthesis (DNA ® RNA ® protein).